THE HEDONIST JIVE: "IN THE SHADOW"
Instead of whinging and wringing my digital hands about the death of foreign film in US arthouse movie theaters, as I have frequently in the past on this blog, I'm trying to go see it in person as often as I can when small fringe film festivals come to my town. This past week San Francisco saw a short series of films from the Czech Republic called CZECH THAT FILM. The series has been on tour around the US, and one of its coordinators told our audience that we were the largest crowd they'd seen in the US except for one they'd recently had in Salt Lake City (!). I guess if I'm starved for experiencing offbeat foreign film on a big screen, well, consider Utah. 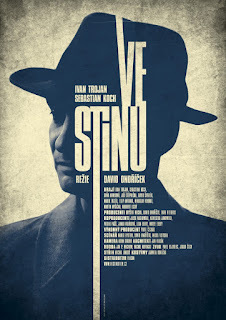 I was there for the closing night film, "IN THE SHADOW" ("Ve Stinu"), a 2012 "Stalinist noir" from director David Ondříček. He told us before the film that he was part of the last generation with plenty of first-hand memory of the Communist era in then-Czechoslovakia, and by his words and his film, it's clear he was none too fond of it. While his film is a mystery/thriller with some interesting plot dynamics, it's also absurdly formulaic. I'm not talking potboiler noirs or modern thrillers, I'm talking "Law and Order" and "NCIS". It's that cheesy. A detective snoops around a house, half in shadow – but wait! Something's dripping from the floorboards, right onto his face! That's not water, that's blood! He heads upstairs, sees a body on the floor, and whack – he's hit from behind! He's out cold! He wakes up – and the body is gone! All I needed was a note saying "You can't catch me ha ha ha ha" to complete the cornball cliché-laden effect. Certainly the music does its part as well: always too loud, too melodramatic, and telegraphing what's about to happen from a mile away. Essentially what you've got is a hardened detective sent to investigate a robbery purportedly made by Jewish group; except his corrupt, Soviet-influenced bosses really don't want him to find out the truth. ("You can't handle the truth!" - nah, they didn't really say that). A German, ex-Nazi minder/detective is sent to watch his every move, and ultimately we find out a little bit more about him that's not really what we expected. There's a ludicrous, meaningless scene in the downstairs boiler/laundry room in which the German gets a surprising come-on from the detective's hot wife, whose cleavage is popping out all over in a scene totally at odds with her staid character the rest of the film. Of course, the consummation of their unspoken desire is broken up just in time – but the detective beats up the German anyway! "IN THE SHADOW" won several awards in the Czech equivalent of the Oscars last year, and good for Ondříček. I'm a jaded cynic, one who nonetheless found some room to cheer at the climax of the film, which ended on a dramatic and slightly dark note and was well played. Then again, some of those "Law and Order" reruns I watched on TBS with my grandpa before he died were pretty well-played as well.